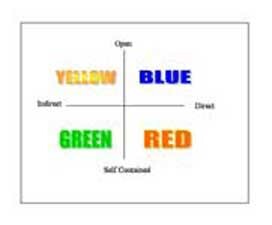 Personality types are like a Rainbow – Made up of many colours. Different personality types are like the colours of a rainbow -vivid, vibrant and varied yet fundamentally the same. If you are looking for fun personality type tests or quiz you'll want to check this out. Generally we can have four types of personalities. I like to use colours to describe each of them simply because it is easier to ‘see’ and ‘remember’. Many others have used animals and their characteristics to describe these different personality type traits. With each of these ‘groups’ there is ‘nothing wrong’ with them as people. They each simply show different character traits, when understood, will help you respond more appropriately and your communications will be far more effective. These are usually your ‘heavy hitters’. They come in to a ‘new market’ and set the place on fire. They are very results orientated and very much in control and directive. They will come in and ‘teach’ their people to do it ‘their way’. After all there isn’t any other way! You certainly want people like this in your business as they make things happen. However not everyone can ‘do the business’ like they do and here’s why. We are the light hearted, fun loving, easy going people. Any parties happening around here? The Blues will be there. It is these types of characteristics that can annoy the Red’s and Greens. These are your detail people. Analytical and meticulous. They will follow each and every step. You ask them a question on product ingredients or compensation plans they‘ll be able to explain ALL of it. Sometimes they are so busy analyzing everything they forget to take action. YELLOW These are your cuddly people. They just LOVE everyone. I call them ‘mother hen’s’ they are compassionate, caring and dependable. They are out to ‘save the world’ and love working in a ‘team’. Because of these wonderful traits they are often walked on because they are over accommodating and may sacrifice results for the sake of harmony. They don’t like confrontation even when it is needed. You definitely want them in your business as they will ‘nurture’ their people for the long haul. Obviously these categories are not black and white because we all are multi-faceted. However once you start looking, you will see a general trend where you can pick these dominant characteristics. Once you understand these you can then reflect that style back to the person you are communicating with – in other words learn to become a chameleon. Understand that each of these types of people will want to ‘do the business’ to FIT their personality. Makes senses doesn’t it. Why force people to become someone they aren’t. Doesn’t it make more sense to work ‘with their personality’ and show them how they can be successful regardless of their personality type? For example once I understood my husbands main characteristic and his need to be meticulous and in control I was then able to ‘allow him’ to be that way with out trying to ‘change’ him! Makes a BIG difference! Five-Minute Free Personality Type Test You can download this fun little free personality test to check out yourself and your friends! Enjoy! Enjoy!